Israeli Prime Minister Benjamin Netanyahu's speech to Congress has become a political football as Israelis head to the polls on March 17 for a tightly contested parliamentary election. Despite the strong criticism from prominent Israeli leaders and analysts over the process and tactics in which Netanyahu accepted the invitation, there is overwhelming agreement on their concern that the Obama administration will agree to a bad deal with Iran. Labor Party/Zionist Union candidate and opposition leader, Isaac Herzog, called the speech "a strategic mistake" but told CNN's Fareed Zakaria, "there is no difference in Israel as to the strategic threat that emanates from the Iranian nuclear program. Clearly, no Israeli leader—and me included—will ever accept a nuclear Iran." Herzog's Labor Party is locked in a close race with Netanyahu's Likud Party. The prime minister has been campaigning on his security credentials, portraying Herzog as inexperienced and too weak to address Israel's security challenges. While not explicitly commenting on whether the reported deal was bad or good, Yesh Atid's Yair Lapid explained that "there are too many centrifuges still there, and this is not harsh enough or strong enough toward the Iranians." Netanyahu explained his rationale in an interview last Friday with Israel Hayom: "What are we expected to do with such a fateful issue?" the Prime Minister asked. "Put our heads down? Go back 80 years to a time when Jews were forced to cower before the nobility? Ignore a threat of annihilation? Not demand action? Stop interrupting? I refuse to accept that." These sentiments track closely with polls of Israeli attitudes toward a deal with Iran and their perceptions of President Obama, who told the 2012 AIPAC Policy Conference, "There should not be a shred of doubt by now—when the chips are down, I have Israel's back." However, according to an early February survey by The Times of Israel, Israelis have an increasingly negative perception of Obama, and decreasing faith in his ability to prevent Iran from attaining a nuclear weapon. An overwhelming 72 percent of likely Israeli voters do not trust Obama to ensure that Iran does not attain a nuclear bomb. They give Obama 33 percent favorable and 59 percent unfavorable rating. 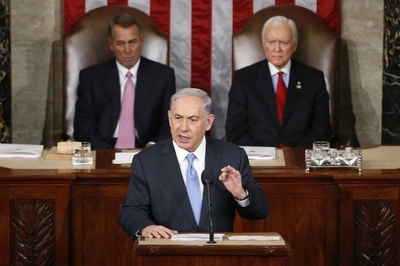 With Netanyahu's speech in the rearview mirror, the inevitable political spin picked up pace. Netanyahu said his speech about the Iranian nuclear threat was "well worth the cost of confrontation" with President Barack Obama, adding that his remarks "were very well received by the American public as well as the members of Congress, both Republican and Democrat." Aaron Sagui, the Israeli Embassy spokesman, echoed the Prime Minister's sentiments. "We feel fortunate to have had the opportunity to make Israel's case about Iran's quest for nuclear weapons, which would threaten the survival of the one and only Jewish state and endanger world peace." Mike Cohen, founder of the Galilee Institute for Practical Zionism and editor of Zionism, Post Zionism and the Arab Problem, explained that Netanyahu's supporters and detractors ran along party line in Israel. "Anyone openly willing to join a Netanyahu-led coalition is praising the speech. Those who are looking to create a Labor-Livini-led coalition are calling it a travesty and worse. Very few, if any, have crossed lines." Joel Parker, researcher at the Moshe Dayan Center for Middle Eastern and African Studies, focused on the American political dynamic that played out surrounding the speech and how it was viewed in the wider region. "It's unfortunate that the message sent by those who boycotted Netanyahu's speech was that any dissenting voices from the Middle East are not welcome in the official political debate in America," he said. He also pointed to articles in Al-Arabiyya and Asharq alAwsat that called on President Obama and Secretary Kerry to listen carefully to what Netanyahu had to say. Asked if Israelis would conclude that the U.S.-Israel relationship is becoming a partisan American political issue, Cohen explained, "It is hard, in general, for citizens of a party-based, coalition government system to understand the workings of a two-party, direct election system. So the average Israeli looks at the U.S. as a monolith and only rarely can discern the difference between the White House and Congress." Among Israeli politicians, those that support Netanyahu and Likud tend to focus on the continued cooperation with the U.S. in many important areas, despite the recent dust up. "Those that wish to see a change ignore Congress and only focus on the words coming from the White House," he said. Sagui, the embassy spokesman, did not believe that the U.S.-Israeli relationship was becoming a more partisan issue. "As the Prime Minister said, Israel should always remain above partisan politics and that was reflected in his speech's reception by both Democrats and Republicans alike." Those concerned with the appearance of deteriorating U.S.-Israel relations at the political level will take solace in a recent Gallup poll conducted from February 8-11 which indicated that Israel still enjoys a 70 percent mostly and very favorable rating among the American public. It also found that the political tension felt inside the beltway has not hurt Netanyahu's image with the American public at large. Netanyahu recognized this trend while defending himself against accusations that the bilateral relationship will suffer as a result of the speech. "The relationship with the U.S. is strong enough. It will experience ups and downs, currently on its way up. If the hope in Israel was that Netanyahu's speech would drastically change the Israeli electoral landscape, several polls suggested there was only a little bump in the prime minister's direction. A survey conducted by Israel's Channel 10 television showed Netanyahu gaining two seats since the speech. Israel's Channel 2 had his Likud Party gaining one seat. Both surveys put his total number of seats at 23, even or just behind Herzog's Labor/Zionist Union coalition. The Knesset holds 120 seats and a majority coalition of parties are needed to govern. The two surveys by the Israeli television channels found Netanyahu favored by 44 percent for the job of prime minister, a tick up of two percentage points from a week ago, while Isaac Herzog's number declined by two percentage points to 35 percent over the same period, according to Channel 10. Israel's Channel 2 asked if the speech strengthened or weakened support for Netanyahu: 44 percent said it strengthened, 43 percent said it had no influence, and 12 percent said it weakened their support. Netanyahu's speech may attract some voters to his Likud from further right parties but it will likely have little effect on those to the center left. Benjamin Netanyahu is a known quantity and most Israelis have already made up their minds about him. The race remains neck and neck in the final stretch leading to the March 17 elections. As for whether his speech moved the needle in Congress or in negotiations with Iran, only time will tell. Bilateral talks between the U.S. and Iran were set to reconvene on Sunday in Switzerland, with a deadline for reaching a political understanding set for the end of the month. UPDATE: Since writing this article, the last polls came out in Israel, four days before the elections. Yediot Aharonot pubished a survey Friday asking what the main issue voters were focused on: 55.2 percent said socioeconomic issues while only 28.4 percent said security or foreign policy. The lastest polls also indicate that whatever bump Netanyahu may have received from his speech to Congress has quickly vanished. An average of the polls show that Likud trails Labor/Zionist Union by three to four seats with roughy 26 seats for Labor and 22 seats for Likud. If these number hold through the elections, Labor will likely have the first three weeks to form a coalition. But that might still prove more difficult for Herzog than Netanyahu. Election day only inaugurates the start of the elections; the "horse trading" in the weeks that follow will determine who will next lead Israel and what the composition of the coalition will be.